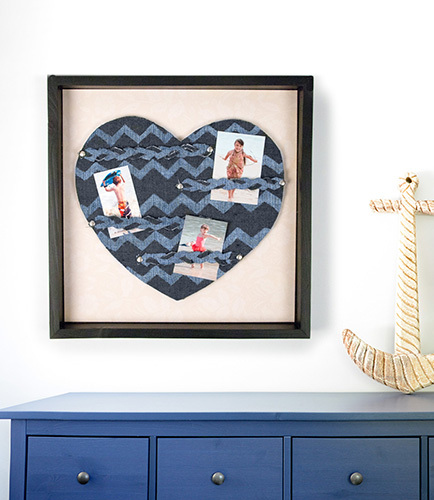 Smooth sailing is ahead with this cute photo memory board project, which is no trouble to make and a perfect fit for a nautical-themed room. Select desired denim solid from the Denim stack. Select a coordinating print. Put the print in the 12”x12” shadowbox. Cut a 10-1/2”x10-1/2” heart. Adhere this to a piece of craft foam and trim around the edges so no foam is showing. Adhere the grouping to the center of the print in the frame. Cut a chevron design from a contrasting denim sheet. Lay this on top of the heart, arranging until desired look is achieved. Adhere in place. Cut (12) 1/4"x6” strips of denim from various pages. Put a brad through the first (3) of the 1/4”x6” strips then braid them together.Hold the braid in place with a brad at the other end. Repeat until there are 4 sets of braids. Place the braids across the heart as desired then adhere the ends of each strip in place. Add in pictures or other memorabilia then hang where desired. When creating the chevron design, trace it out on the back of the denim paper first before cutting. Use the paper piercer to help when putting the brad through the denim.